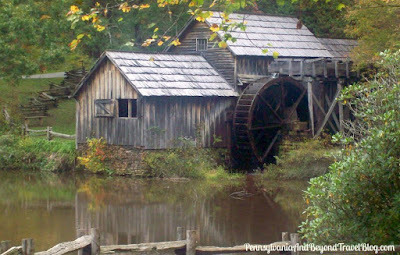 Mabry Mill is an old watermill and tourist attraction located off the Blue Ridge Parkway in Floyd County, Virginia. You'll easily find it at milepost 176.1 when traveling on the parkway. There is a parking lot that you can pull into, so that you can easily visit the attraction and walk the trails. On the historic property you'll find the watermill, sawmill, gristmill and blacksmith shop. The watermill was built by Edwin Boston Mabry in 1903. Over the years the owner added the sawmill, gristmill and blacksmith shops. During the summer tourist season you can see live demonstrations for live milling, basket making, spinning, weaving, seat caning, butter making, blacksmithing, etc. along with music events by local artisans and the National Park Service staff. You'll find all kinds of different activities and events that are open to visitors from April to November. Nearby you'll find the Mabry Mill Restaurant and Gift Shop where you can sit down and enjoy a home cooked meal featuring a country-style menu. The food is delicious, affordably priced and the restaurant staff is fantastic. At the gift shop you'll find Virginia-made arts and crafts, locally made food, clothing, books, souvenirs and gifts.